You are here: » Home » Europe » 4 Deserts with the Weirdest Panoramic View in the World! 4 Deserts with the Weirdest Panoramic View in the World! It is not always arid atmosphere can a traveler sees when traveling to a desert. Some areas in this world has a desert with a strange sight. Want to know what? See the surface of the wavy yellow sand blowing in the wind, may have often. But what if the desert is in the snow, have seven colors, or composed of salt? This is just incredible. Hundreds of giant crystals with a height of about 12 meters does not exist on the surface. 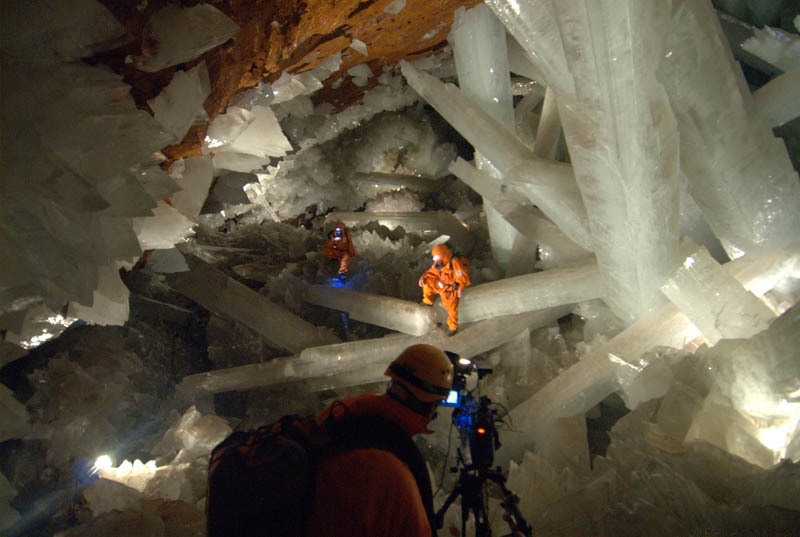 However, these crystals flourish under Chihuahuan Desert located in the Naica Mine, Mexico, Central America. Collection of giant crystals are now known as the Giant Crystal Cave. As described in the official website of The Giant Crystal Project Site, under the desert there are about 170 crystals as high as 1 to 2 meters. Like a barren desert and arid, the inside is also very hot. Temperatures below the Chihuahuan Desert can reach 60 degrees Celsius with a humidity level of 90-100 percent. Discard your assumptions are thinking that surely arid and hot desert, when viewing Chara Sands. 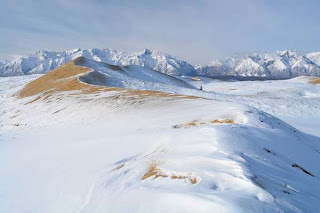 How not, desert in the Trans-Baikal region, Siberia Mountains, Russia is in the mountains of snow. Interestingly, not only was the brown desert around it also there was a layer of super snow white. Desert oasis or a rock may be used. But the snow and the desert only in Chara Sands. This is what makes Chara Sands has a super unique panorama. There will be no camel, you will only see the Siberian bear, or elk. In winter, there will be more snow cover Chara Sands. But, during the summer, the snow is somewhat reduced and the desert is more subtle look. Sometimes, the desert is also covered with snow, especially during the winter greeting. However, the snow never stand too long in there. Finished winter, desert again became fascinated with anomalies and ready to satisfy the curiosity of the tourists. Then usually when traveling into the desert only see shades of brown or white, another when you come to Charamel village, in the district of Black River, Mauritius Island, east Africa. Approximately 7,500 square meters sprawling sand and sparkling with a variety of different colors. There are sand colored red, brown, purple, green, blue, yellow, and orange are combined into one. This scene also managed to create a magical landscape that blends into one. According to the story, the buildup of sand that had been years since this may cause the color formed from volcanic rock fragments colorful mixed with various minerals contained in the soil. 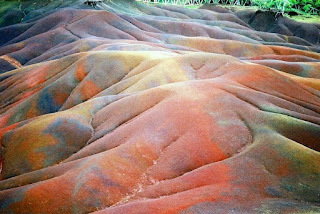 Seven Colored Earth is almost always filled with tourists domestic and foreign. In fact, once the tourists are allowed to step on and climb these dunes. But unfortunately, at this time the desert is bounded wooden fences, so the traveler can not enter. 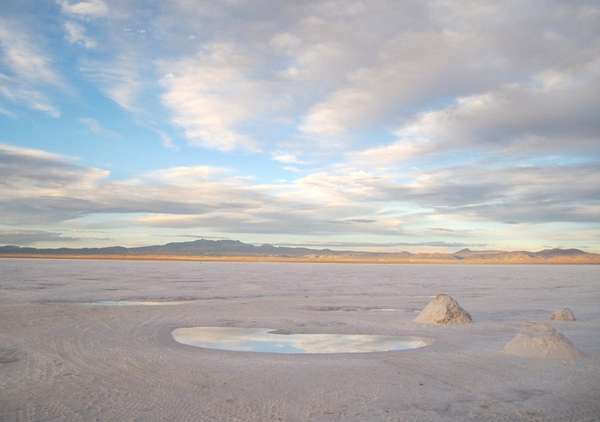 If the desert is usually synonymous with sand, another case with the desert in Bolivia which is entirely in the form of salt. Salar de Uyuni, a destination near the Andes Mountains, is the largest salt desert in the world. As reported by the Lonely Planet website, the uniqueness of this place is already known to the foreign tourists. Travelers who stop and come to the site can enjoy views of the sea salt was even its hotel made ​​of salt. This salt desert has an area of ​​about 10,582 square kilometers. Apparently Salar de Uyuni is part of Michin Lake, a large lake in prehistoric times. Then Michin lake dried up and left the Salar de Uyuni. Article : 4 Deserts with the Weirdest Panoramic View in the World! 0 Respones to "4 Deserts with the Weirdest Panoramic View in the World!"